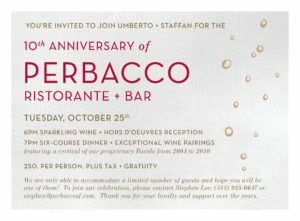 You’re invited to join Umberto + Staffan for the 10th Anniversary of Perbacco Risortante + Bar on Tuesday, October 25th. We are only able to accommodate a limited number of guests and hope you will be one of them! To join our celebration, please contact Stephen Lee: (415) 955-0647 or stephen@perbaccosf.com. Thank you for your loyalty and support over the years. To join our celebration, please contact Stephen Lee: (415) 955-0647 or stephen@perbaccosf.com.